GRAND PRAIRIE, Texas & NEW YORK — (BUSINESS WIRE) — March 3, 2016 — Six Flags Entertainment Corporation (NYSE: SIX), and Samsung Electronics America, Inc., today announced a broad marketing partnership which appoints Samsung as the “Official Technology Partner” of the world’s largest regional theme park company. 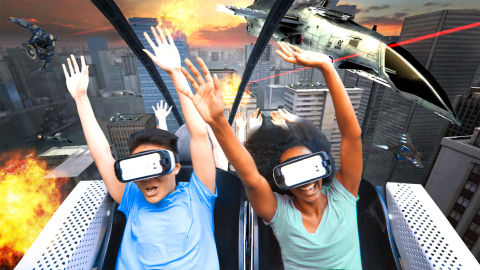 The partnership includes the debut of ground-breaking experiences coming to nine Six Flags parks - North America’s first Virtual Reality (VR) Roller Coasters, using Samsung Gear VR powered by Oculus. “This remarkable technology is a definite game-changer for theme park rides and represents everything our brand stands for - delivering the most thrilling and innovative rides and attractions in the world,” said John Duffey, Six Flags President and CEO. “With the addition of these virtual reality coasters, Six Flags will be introducing more than double the number of new coasters and rides than we did in 2015, and more than any year in the last decade. Innovation is part of our DNA, and news in every park every year is driving higher guest satisfaction and building strong momentum for our company."